Although spatial differences in economic development tend to be highly persistent over time, this is not always the case. 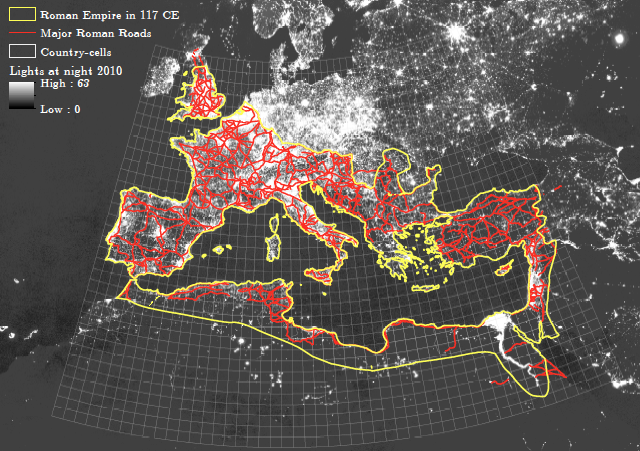 This column combines novel data on Roman Empire road networks with data on night-time light intensity to explore the persistence and non-persistence of a key proximate source of growth – public goods provision. Several empirical strategies all point to the Roman road network as playing an important role in the persistence of subsequent development. Spatial differences in economic development tend to be highly persistent over time. Comin et al. (2010) document, for example, that countries that were closer to the technological frontier as early as 1500 CE are comparatively richer and more technologically sophisticated today, while Maloney and Valencia (2016) document persistence in population density across half a millennium, comparing regions at the sub-national level within the New World. Findings such as these have led to a large literature that tries to identify fundamental sources of comparative development in initial conditions, and historical processes from the distant past. Spolaore and Wacziarg (2013), Nunn (2014), and Ashraf and Galor (2018) present recent surveys. At the same time, differences in comparative development are not always persistent. For example, Acemoglu et al. (2002) document a reversal of fortune across former colonies during the last 500 years. These findings raise questions about which proximate factors generate the observed persistence in comparative development, and why the persistence sometimes breaks down. In this regard, we know much less. A deeper understanding of the channels through which persistence in comparative development emerges may leave clues about which fundamentals are important, and how to support development in situations where these fundamentals are lacking. In a recent study, we explore the persistence and non-persistence of a key proximate source of growth – public goods provision (Dalgaard et al. 2018). The specific form of public good in focus is roads, and we take the roads built during the Roman Empire as our point of departure. In particular, we examine the persistence in road density across time, and its role in generating persistence in economic development across regions that were part of the Roman Empire at the beginning of the 2nd century. Throughout the analysis, our unit of observation is a pixel of 1x1 degrees of latitude by longitude. In order to measure road density, we build a buffer of 5 km on each side of all roads and measure the buffer area relative to the total pixel area. The data on Roman roads derive from Talbert (2000). We repeat that exercise for the network of modern main roads, with data from the Seamless Digital Chart of the World Base Map (v. 3.01). We measure economic activity during antiquity using the Digital Atlas of the Roman Empire by Åhlfeldt (2017), which provides data on Roman settlements circa 500 CE. For the contemporary era, we use two independent measures of economic activity: population density and the intensity of lights at night, following Henderson et al. (2012). Notes: The map shows major Roman roads (red lines) within the boundaries of the Roman Empire (yellow lines) in 117 CE, and nightlights intensity in 2010 in the background (white color). Figure 1 gives a visual impression of the road network within the Roman Empire in 117 CE. At its zenith, the system involved an impressive 80,000km of roads. The map also shows contemporary economic activity measured by nightlights. From a bird’s-eye view, there does seem to be a (reduced-form) link between the location of ancient roads, and economic activity today. To understand that link better, we turn to regression analysis. A key challenge in identifying the effects of ancient infrastructure is filtering out the effect of underlying (geographic) factors that may have influenced both Roman road density and modern-day outcomes. Another concern is how to separate the effect of ancient infrastructure on economic development from the potential broader influence of the Empire (e.g. via institutional or cultural channels). We address these issues in several ways. First, we focus exclusively on observations (i) within the boundaries of the Roman Empire, and (ii) that were ‘treated’ by at least one road. By focusing on areas connected to the network, we reduce the risk of omitted variables bias, and the risk that our results convolute the impact from the legacy of Roman rule more broadly (e.g. Landes 1998). To further partial out a potential Roman legacy on contemporary outcomes, we control for country fixed effects as well as language fixed effects, which help us to deal with institutional and within-country cultural variation (e.g. Andersen et al. 2016). Second, based on the literature on Roman road construction and our own formal tests thereof, we control extensively for potential geographic confounders throughout the entire analysis. Third, we exploit a natural experiment to which we return below. Our baseline findings indicate a clear tendency for persistence in road density within the areas covered by the empire by 117 CE. Figure 2 illustrates this result – areas that featured relatively high road density in antiquity on average also feature relatively high road density today. 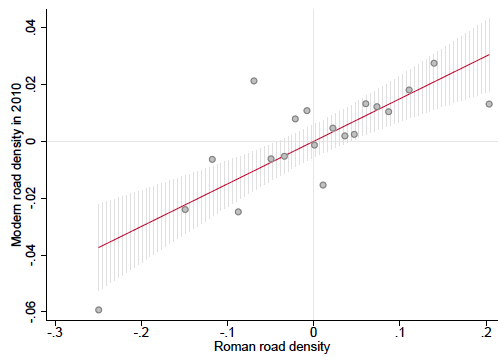 Notes: The figure shows the conditional residual binned scatter plot of the relationship between Modern road density (in logs) and Roman road density (in logs) within the Roman Empire in 117 CE. The binned scatter plot groups the x-axis variable into equal-sized bins, computes the mean of the x-axis and y-axis variables within each bin, and shows a scatterplot of these data points. Also imposed is a 95% CI. The footmarks of Roman roads are visible elsewhere. By the end of antiquity, areas with greater density of Roman roads featured greater settlement density, and for the contemporary era we also find greater population density as well as greater nightlights density. These findings suggest that, on average, early infrastructure investments tended to persist over time, and attracted – or possibly generated – economic activity. Overall, our baseline results indicate that public goods provision likely plays an important role in generating persistence in comparative development. Despite our best efforts, our baseline findings may still suffer from omitted variable bias. To gauge the likelihood that this is the case, we turn to a third identification strategy, namely, using the abandonment of the wheel as a natural experiment. A remarkable fact of world history is that wheeled transport disappeared in the Middle East and North Africa (MENA) during the second half of the first millennium CE – which is perhaps especially surprising in that wheeled transport had a very long history in that region before its abandonment. Bulliet (1990 ) argues that the key proximate reason for the abandonment of wheeled carriages in MENA was the emergence of the camel caravan (“the ship of the desert”) as a more cost-effective mode of transporting goods. While this seems like a reasonable explanation, it immediately prompts the question of why the ox-drawn carriage then continued to dominate land-based transport until the first half of the first millennium CE. After all, the domestication of the camel on the Arabian Peninsula pre-dates the Roman era by millennia. Bulliet’s core argument is that a series of developments had to take place before the camel could emerge as the dominant mode of inland transport in MENA. In particular, the emergence of a new type of camel saddle by 100 BCE made it possible for camel herding tribesmen to utilise new types of effective weapons, which allowed them to gradually gain control of the trade routes and, therefore, gain political power as well. Accordingly, the camel caravan could not enter the scene in a major way until these events had unfolded. From the point of view of the present study, the abandonment of the wheel experiment in MENA opens the door to an interesting set of tests. Naturally, within a region where wheeled transport disappears, one would expect to see less maintenance of (Roman) roads. Moreover, when wheeled vehicles reappear in the late modern period, the principles underlying road construction surely differed from those during Roman times. Consequently, in the MENA region, Roman roads should be a weak predictor of contemporary roads density and, by extension, Roman roads should also be a weak predictor of contemporary comparative development. In contrast, within the European region where wheeled carriages were in use throughout the period, one would expect more maintenance and therefore more persistence in road density and, by extension, Roman roads should be a stronger predictor of contemporaneous comparative development. When we split the data and estimate our baseline model on the MENA and the European samples separately, this differentiated influence from Roman roads indeed emerges. 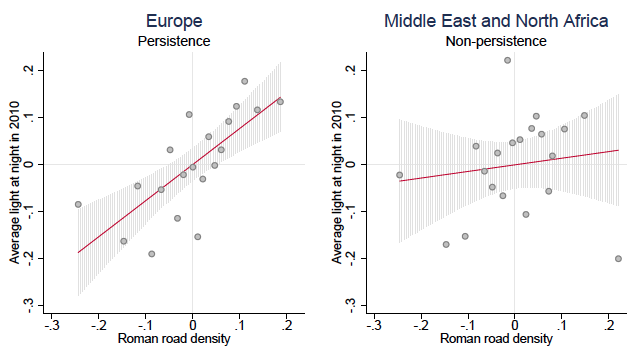 Roman road density is not a statistically strong predictor of current road density nor economic activity within MENA, despite the fact that Roman roads do predict comparative economic activity prior to the abandonment of the wheel. Within the European region, Roman roads not only predict current infrastructure, but also ancient and current economic activity. Figure 3 provides a visual illustration of the differentiated link between Roman roads and comparative development within MENA and Europe, respectively. Notes: The figure shows the conditional residual binned scatter plot of the relationship between nightlight intensity (in logs) in 2010 and Roman road density (in logs) within the European and MENA regions of the Roman Empire in 117 CE. The binned scatter plots group the x-axis variable into equal-sized bins, compute the mean of the x-axis and y-axis variables within each bin, and show a scatterplot of these data points. Also illustrated is a 95% CI. Acemoglu, D, S Johnson and J A Robinson (2002), “Reversal of fortune: Geography and institutions in the making of the modern world income distribution”, Quarterly Journal of Economics 117(4): 1231–1294. Andersen, T B, C J Dalgaard and P Selaya (2016), “Climate and the emergence of global income differences”, Review of Economic Studies 83(4): 1334–1363. Ashraf, Q and O Galor (2018), “The macrogenoeconomics of comparative development”, Journal of Economic Literature, forthcoming. Bulliet, R W (1990 ), The camel and the wheel, Columbia University Press, Morningside Edition. Comin, D, W Easterly and E Gong (2010), “Was the wealth of nations determined in 1000 BC?” American Economic Journal: Macroeconomics 2(3): 65–97. Dalgaard, C-J, N Kaarsen, O Olsson and P Selaya (2018), “Roman roads to prosperity: Persistence and non-persistence in public good provision”, CEPR Discussion Paper 12745. Henderson, J V, A Storeygard and D N Weil (2012), “Measuring economic growth from outer space”, American Economic Review 102(2): 994–1028. Landes, D (1998), The Wealth and Poverty of Nations, Norton and Company: New York. Nunn, N (2014), “Historical development”, in Handbook of Economic Growth 2: 347–402, Elsevier. Maloney, W F and F Valencia Caicedo (2016), “The persistence of (subnational) fortune”, Economic Journal 126(598): 2363–2401. Spolaore, E and R Wacziarg (2013), “How deep are the roots of economic development?” Journal of Economic Literature 51(2): 325–69. Talbert, R J (2000), Barrington Atlas of the Greek and Roman World, Princeton University Press. Åhlfeldt, J (2017), Digital Atlas of the Roman Empire. Lund University, Lund.